VANCOUVER, British Columbia, March 12, 2019 (GLOBE NEWSWIRE) -- Next Green Wave Holdings Inc. (CSE: NGW) (OTCQB: NXGWF) (“Next Green Wave” or the “Company”), is pleased to announce that it, together with its US subsidiary Crossgate Capital US Holdings Corp. have signed a definitive agreement (the “Agreement”) dated March 11, 2019 to acquire 100% of California-based SDC Ventures, LLC (“SDC”) (the “Transaction”). SDC is a premium cannabis consumer products goods, manufacturing and extraction leader, having 8 leading cannabis brands with 45 CBD and THC products that have a combined global social influencer reach of over 25 million people and with 100+ million YouTube views. SDC (WEARESDC) is a team of brand building, cannabis consumer product goods, manufacturing and extraction professionals, that have decades of experience in cannabis in California. 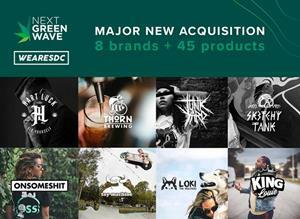 SDC has a growing network of retail and online sales channels including 700 Zumiez stores which compliments Next Green Wave’s current distribution opportunities. Next Green Wave (NGW) is a vertically integrated seed-to-consumer premium medicinal and recreational cannabis company operating in California - the world’s largest cannabis market. NGW has acquired licenses for its nursery/breeding, cultivation, extraction, and distribution operations covering both medical and recreational cannabis production and services. Construction of phase one of the indoor facility (35,000 ft²) has been completed and is now moving into production of premium cannabis products. NGW will push the innovation envelope and will develop premium brands that can be distributed across the globe. NGW has a library of more than 120 genetic cannabis strains which include several cannabis cup award winning genetics. The company has acquired over 15 acres of cannabis-zoned development land in Coalinga, California, providing future growth. To find out more visit us at www.nextgreenwave.com or follow us on Twitter at @nextgreenwave, on Instagram, and LinkedIn. SD Cannabis (SDC) specializes in developing extraction and manufacturing methods that focus on maintaining the quality and natural benefits of cannabis. Through its use of the most sophisticated equipment available, the team takes a scientific approach to capturing all of the active available cannabinoids in the plant and then integrates those ingredients into products without adding other artificial or dangerous fillers. In addition, SDC’s leadership team brings decades of experience in developing, launching and marketing brands across the landscape of culture, art, music, action sports, and fashion with a core understanding of how to leverage the power of today’s influencers to drive consumer demand and product innovation. To find out more, visit us at www.wearesdc.com and on Instagram. CEO and Executive Chairman, Next Green Wave Holdings Inc.